It is always a pleasure for me to visit Sicily. All of my grandparents were born there and Michele and I first went there on our honeymoon. It is such a beautiful and enchanting Island that I will use any excuse to go there. 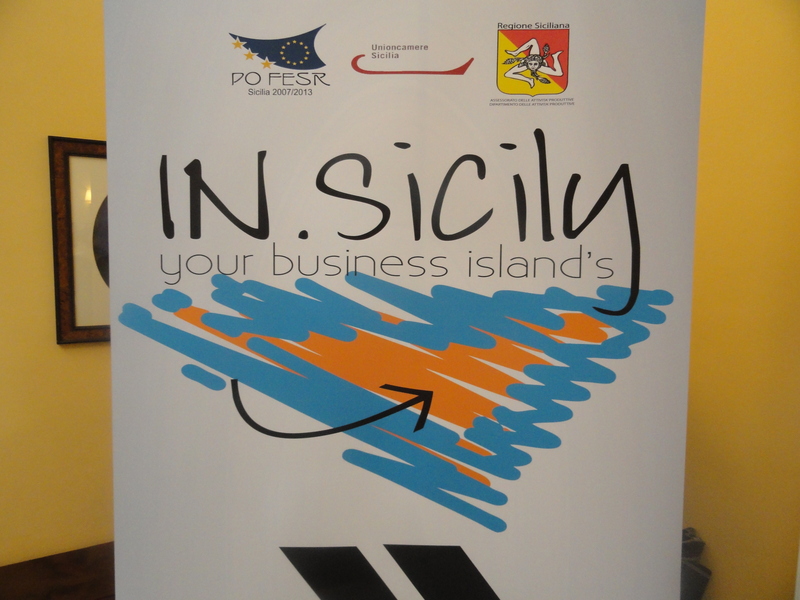 My excuse came in the form of an invitation to spend five days in Sicily tasting wine and food and visiting the sites. I had to accept! 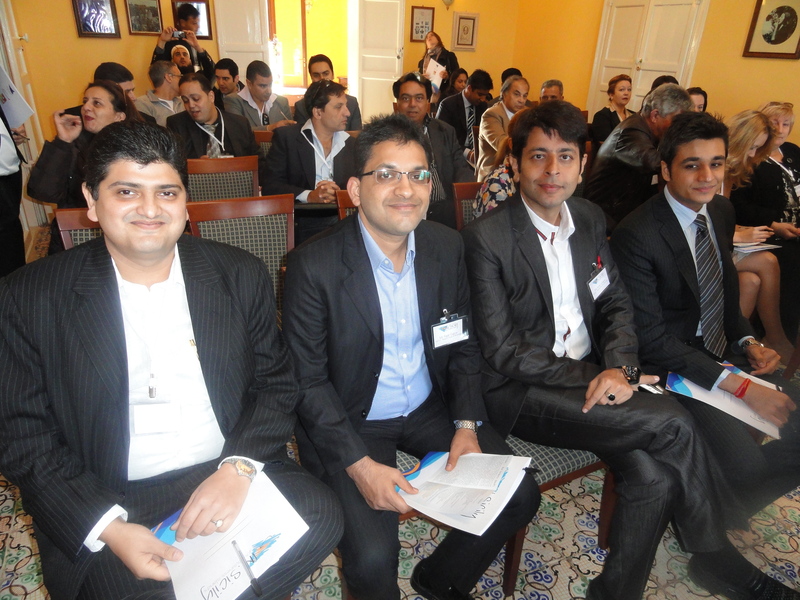 The trip was sponsored by the regions of Trapani, Ragusa and Catania. It was unusual because my fellow travelers included an international group of journalists, wine and food buyers, and travel agents from India, Russia, and Tunisia as well as the USA. I was travelling with my friend, Louis Coluccio owner of Coluccio and Son’s in Brooklyn, wholesalers and retailers of Italian food products. We arrived very late in Palermo and did not get to the Hotel Baglio Oneto, which is between Marsala and Trapani, until after midnight. There was a very nice light supper waiting for us when we arrived. The next morning after breakfast there was a short conference followed by a meeting with different producers of olive oil, wine, grappa, coffee, pasta, balsamic vinegar, and food products. We went around to the different tables to sample the wine and the food products. I stopped at a table that had only one wine and one grappa. 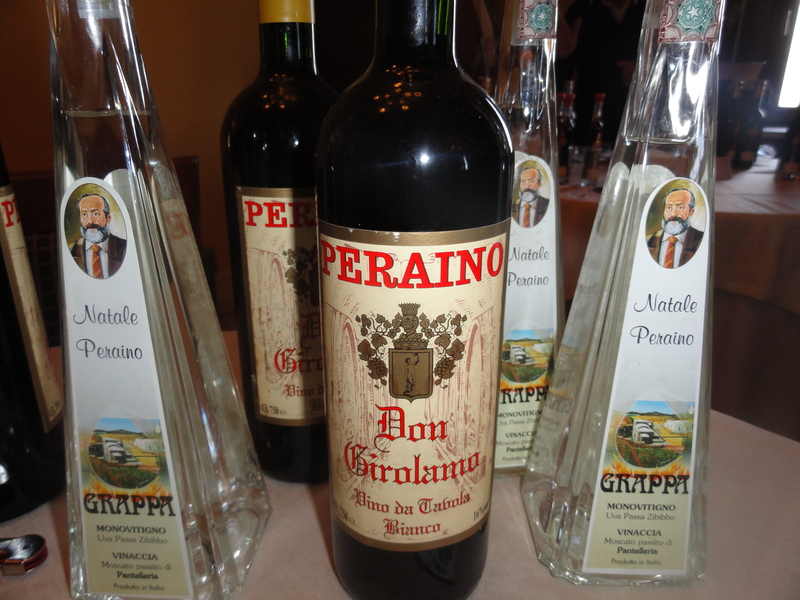 The producer was Natale Peraino and the wine is called Don Girolamo, classified as a Vino da Tavola. It is a white wine made from, I believe, the Grillo grape and it is aged for 10 years in large barrels called botti made of chestnut and oak. It had a very deep orange color and itasted like Marsala, but much more rustic. It was one of the most unusual wines I have ever tasted. It is the only wine that they make and it is not imported into the USA. In the afternoon we visited Frantoio Torredi Mezzo an olive oil mill located in Trapani where the very personable and knowledgeable Alberto Galluffo, an olive oil panel member, is a consultant. 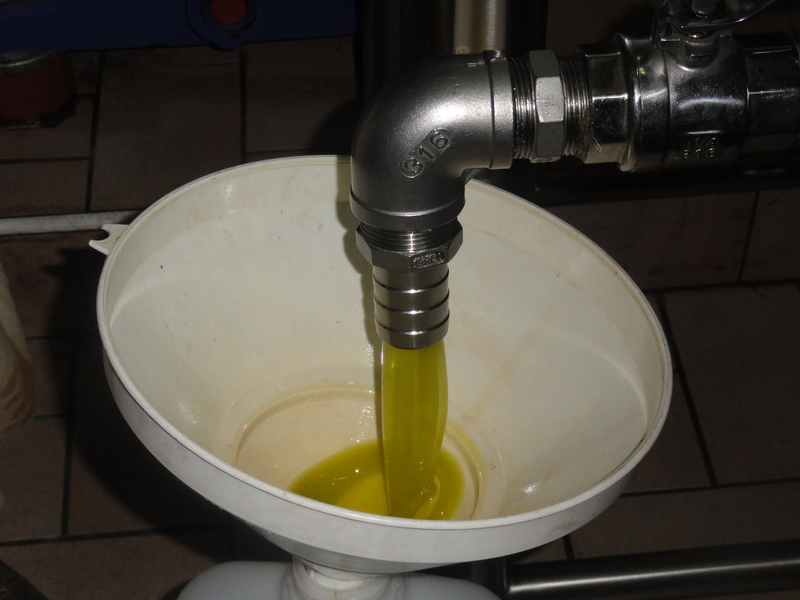 Mr Galluffo also makes his own very good olive oil. This was a state-of-the-art factory and the production was all controlled by a computer. The olive oil I liked the best was made from three different types of olives–Cerasuola 50%, Nocellara 25% and Biancolilla 25%. It had grassy quality and tasted of tomatoes and artichokes. I believe the olive oil from both producers is available in the USA. 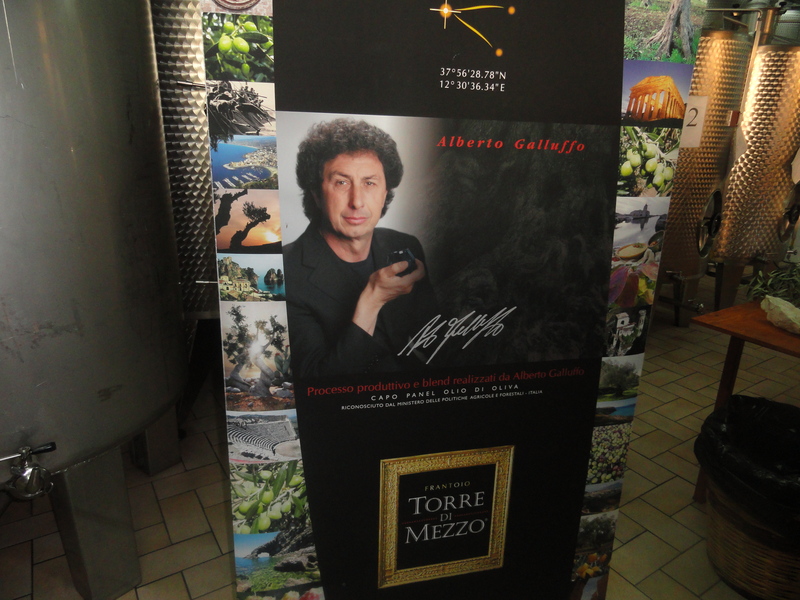 That night we visited the Giuseppe Bianchi Distillery located in Marsala. 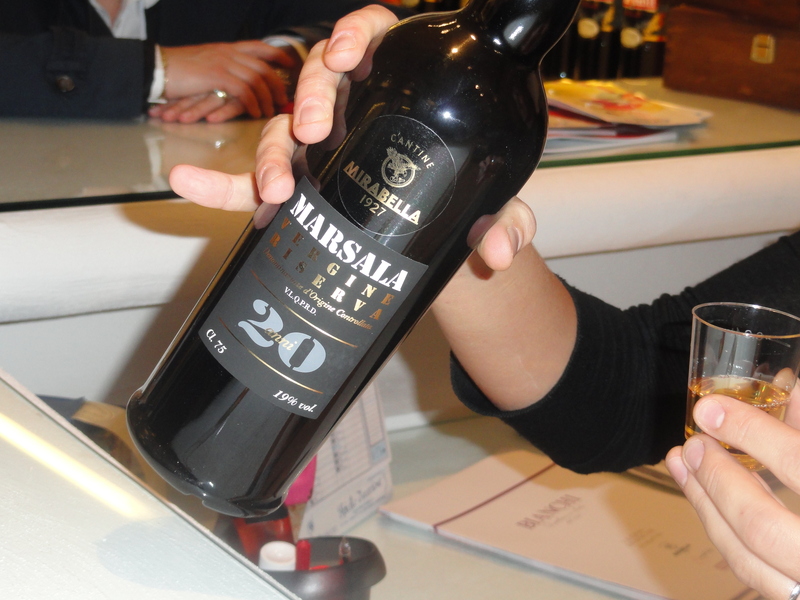 It not only produces grappa but also Amaro and Limoncello as well as well as sweet wine and Marsala. We tasted a Marsala Superiore Riserva 1989 and a 20 year old Marsala Virgine Riserva which were excellent and went very well with the biscotti that they gave us. Their products are not imported into the USA. I often wonder why it is so difficult to find Marsala of this quality here. Near Ragusa we visited another olive oil producer, Frantoi Cutrera, and had a long discussion about virgin olive oil with the son of the owner Sebastiano. The producer said that it must pass a government test to be labeled virgin olive oil and this is partly based on the acidity. He said that there was no such thing as light olive oil or extra light olive oil. When asked about his oil he said that they only press the grapes once and his oil always passes the government’s tests. Their oil is available in the USA. On the way to Catania we stopped for a tasting at the Planeta winery near the town of Vittoria. 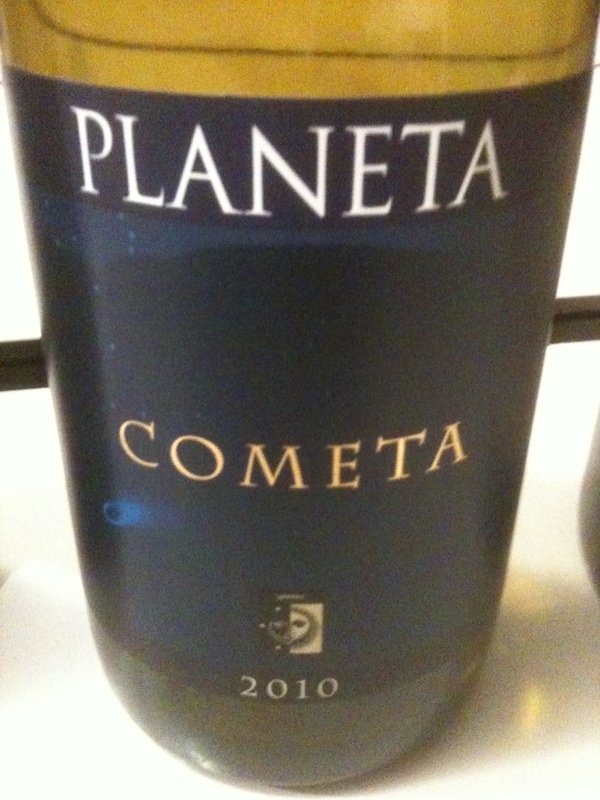 The one wine that I wanted to taste was the Cometa 2010 IGT Sicily. This wine is made from 100% Fiano, a grape that was brought to Campania by the Greeks and gained fame there as Fiano di Avellino. The wine is vinified at the winery in Menfi at Ulmo and the grapes come from the Gurra and Dispensa vineyards. Destemming is followed by gentle crushing and static settling at a low temperature. It is inoculated with select yeast when clear. Fermentation takes place in stainless steel for 20 days and the wine is aged in stainless steel. 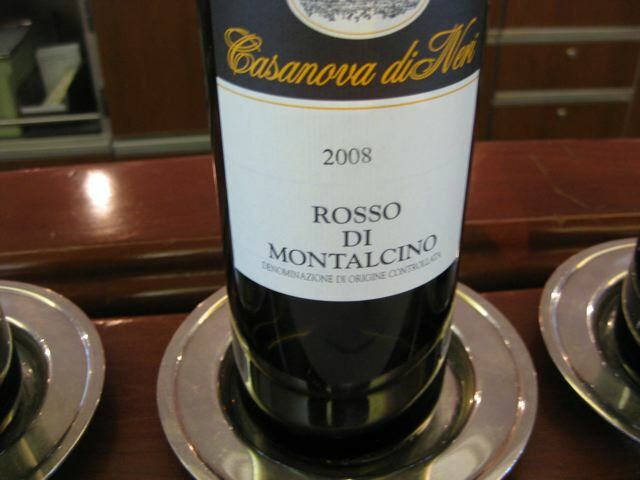 This is an elegant, full-bodied and aromatic wine. It has hints of citrus and tangerine with a nice mineral character and good acidity. 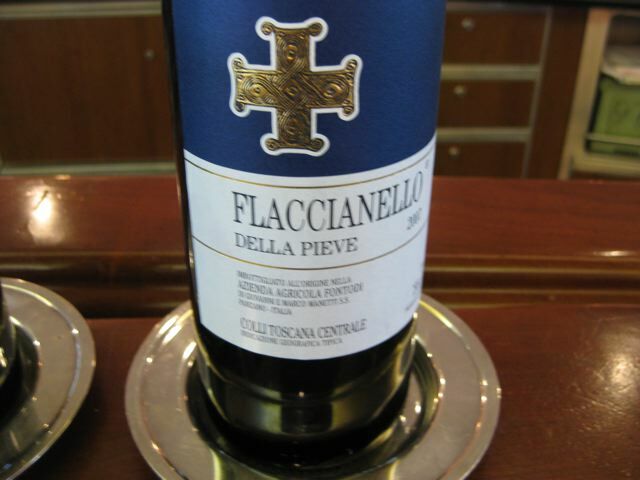 When I tasted this wine in February 2010 at the winery I could not believe how good it was. They told me then that wine is no longer aged in barriques! This is a great white wine. At another tasting of wine and food products in Catania I met Rosario Greco, export manager of the Cantina Vivera winery and we had a very interesting conversation about Sicilian wine. I tasted the “Salisire” Etna Bianco DOC 2009 made from 100% Carricante, one of the best white grapes from the Etna region. The vineyards are at 600 meters and the soil is volcanic with many rounded stones. There are 5,500 vines per hectare and the training is spur pruned cordon. The harvest takes place the second week of October. The grapes are soft pressed without oxygen and are fermented in temperature controlled stainless steel tanks. 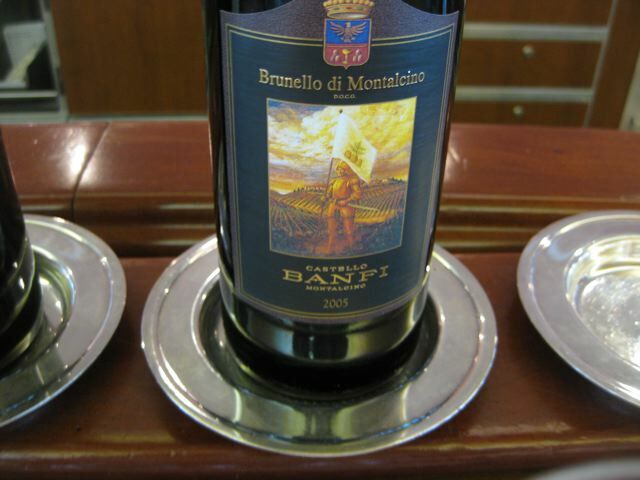 The wine rests on its lees for 10 months and in bottle for six months before release. This is a very fruity up front wine with good citrus aromas and flavors, a mineral character and good acidity. A’ Mami Sicily IGT Bianco 2009 Made from 50% Chardonnay and 50% Carricante. The Carricante comes from Linguaglossa where the Mittinella vineyard is located at 600 meters on the northeastern side of Etna. The Chardonnay comes from Corleone where the Solicchiata vineyard is located at 450 meters. There are 4,500 plants per hectare and the grapes are picked in the middle of August. The wine has citrus aromas and flavors with hints of tropical fruits and mineral notes. 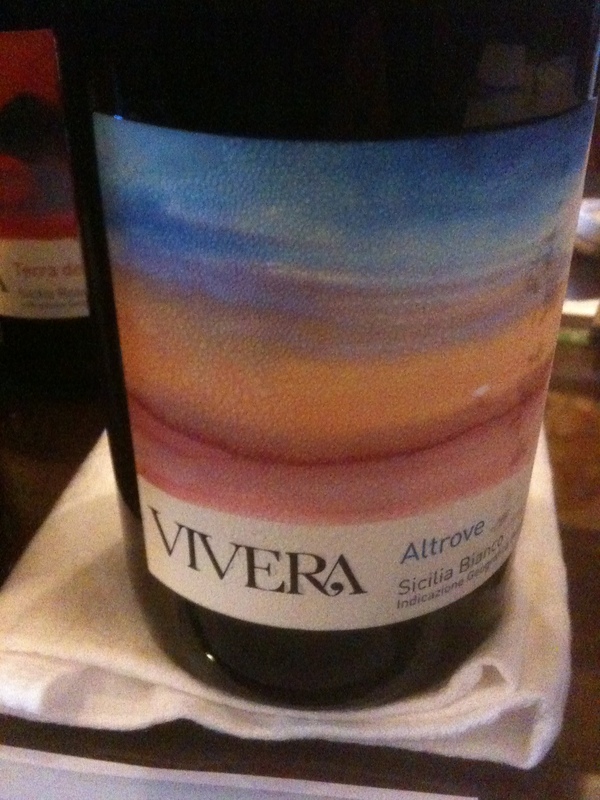 They also make a wine called “Altrove” Sicilia IGT Bianco made from Catarratto, Insolia and Chardonnay from the vineyards of Muranna and Dagata in the hills around Corleone. Rosario said the vineyards were organic and the winery “biological”. These wines are available in the USA. I asked Rosario if he know a good restaurant in the Catania fish market and he suggested a restaurant called M M. This was the best meal we had in Sicily. We ate crudo, followed by pasta with sardines, and a mixed grill including triglia (red mullet), swordfish, calamari, and octopus. 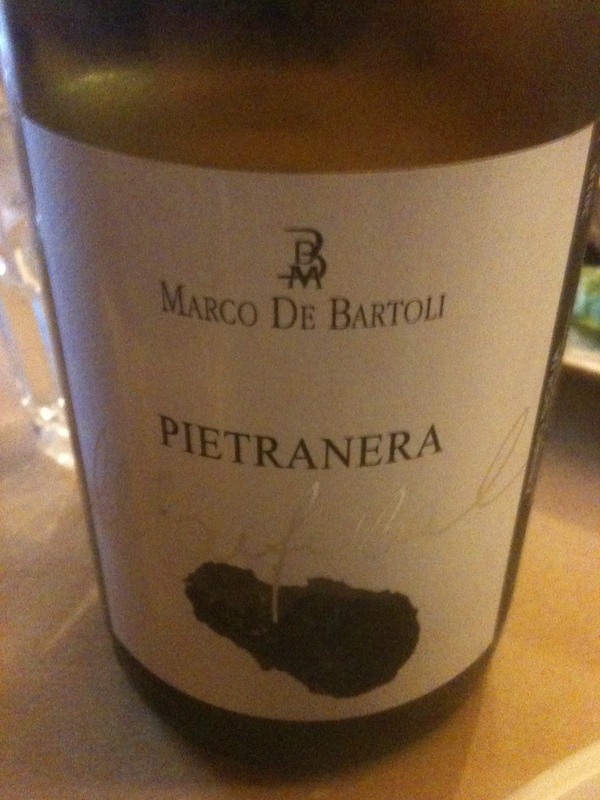 With the lunch we drank Pietranera 2009 made from 100% Zibibbo grapes from Marco de Bartoli. The grapes come from the island of Pantellleria, the closest part of Italy to Africa. Zibibbo grapes are used to make desert wines for which De Bartoli is famous. The vines are on terraced hills at 350 meters, the soil is volcanic and the training system for the vines is alberello pantesco, very, very short vine. This wine however was vinified dry. There was very nice fruit in the mouth but the finish was dry and it was a great combination with the fish we had for lunch. The first night of the cruise aboard the Crystal Serenity I ordered a Martini made with Beefeater Gin and olives. I did not watch while it was being made and it was fine. The next night, Tony Abou-Ganim who calls himself “the Modern Mixologist”, was behind the bar making the drinks. I asked for a Martini and he said “let me make it for you the way I like it”. He said that a Martini should be 4 parts gin to 1 part dry white vermouth and to contrary to what James Bond preferred, it should be stirred, not shaken. Tony said that shaking aerates the drink, which destroys the texture. Only foamy drinks such as a whiskey sour should be shaken. Shaking also causes the ice to melt and the drink to become watered down. Water is an important part of the drink, but should be no more than 20%. Tony feels that a twist of lemon is needed and either two or three green olives, which should be cold. The entire drink should be poured into the glass, which should be chilled. If any of the drink is delivered in a container or held in a container on the side it will become watery. Tony said that he only drinks gin Martinis. Vodka, he feels, does not mix well with vermouth. He likes vodka but not in a Martini. Most people drink their Martinis too dry, Tony said, and they do not understand the drink. Only buy vermouth in a small bottle because after a month, an open bottle becomes stale and it should be discarded. The ice should be fresh, the olives should be cold, and the lemon peel twisted over the drink to release the lemon oils. He made my Martini with Beefeater, which is my favorite gin for a Martini. It was the best that I have ever had. There was a silky quality to it with great balance and flavor! Ever since I studied Byzantine history many years ago, I have wanted to visit Istanbul, or Constantinople, as I like to think of it. 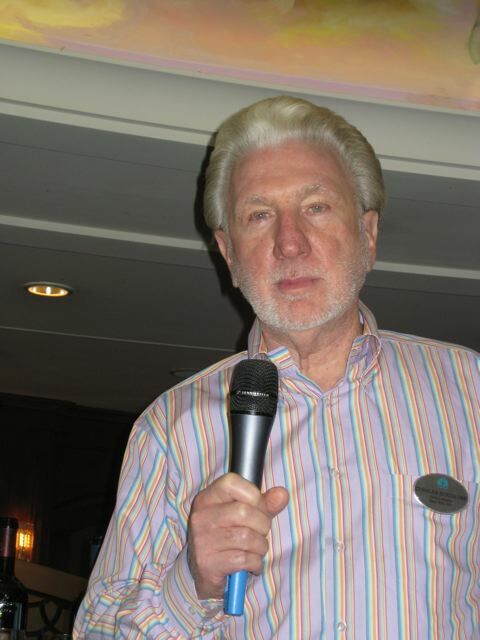 So when the opportunity arose for Michele and I to teach wine and food classes aboard the Crystal Serenity Epicurean Discoveries Cruise, I finally had the chance. We boarded the ship in Athens and during the next two weeks we visited Santorini, Crete, Israel, Cyprus, Mykonos and Kusadasi with Istanbul as our final stop. I can’t think of a more enjoyable or luxurious way to travel. 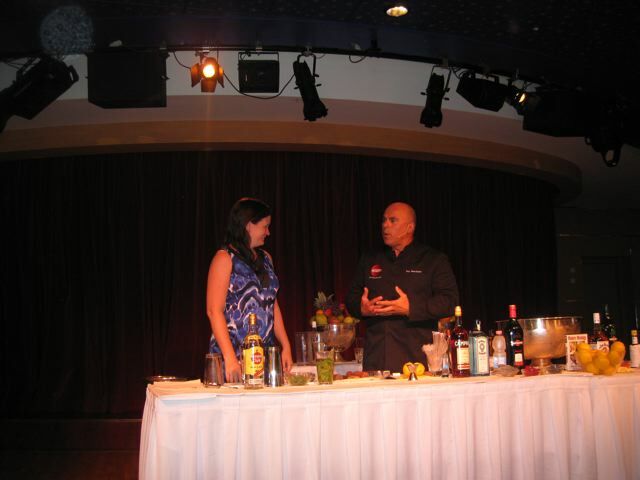 Since it was a wine and food themed cruise, several other presenters spoke or demonstrated on board including Chef Azmin Ghahreman of Sapphire Restaurant in Laguna Beach, California, the “Modern Mixologist” Tony Abou-Ganim, and Darioush Khaledi, owner of Darioush Winery in Napa Valley. 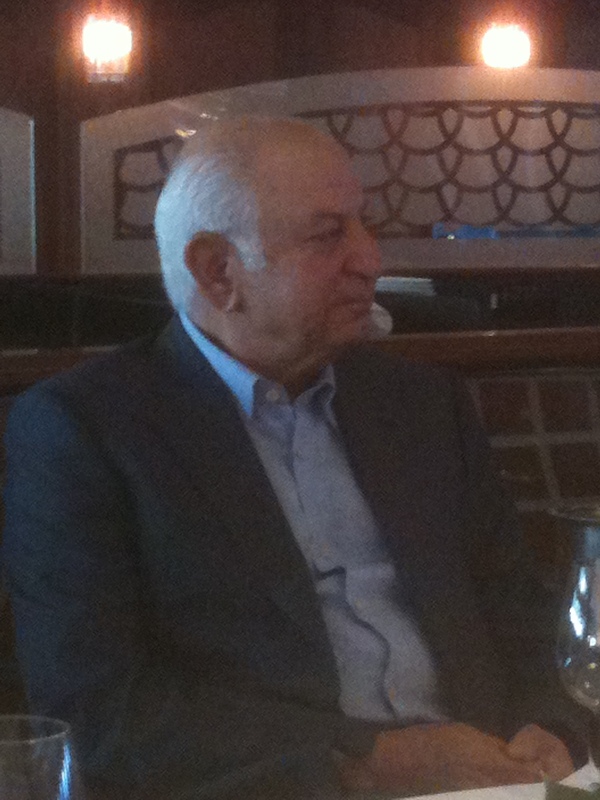 On our first full day at sea, Mr. Khaledi presented his wines in a tasting billed as Bordeaux vs. Napa. 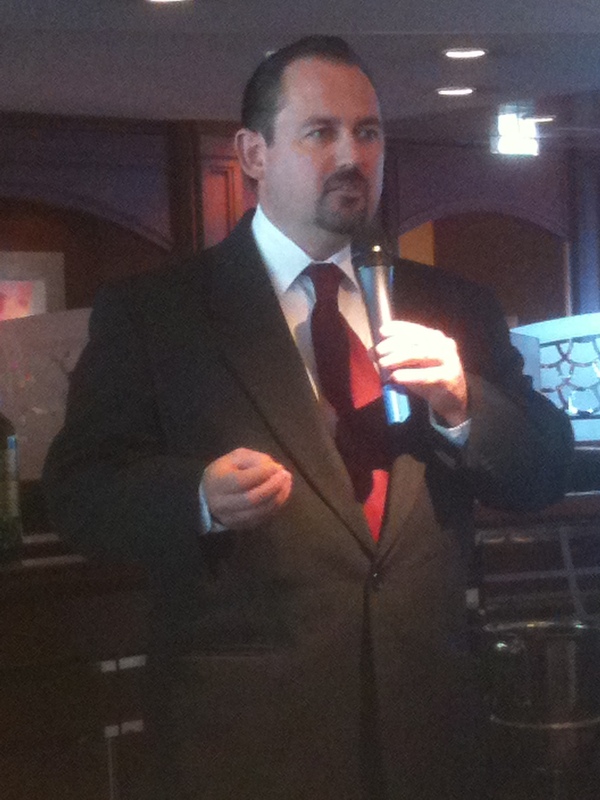 Bart Dufour, the head sommelier for the cruise, introduced him and spoke about the Bordeaux wine. 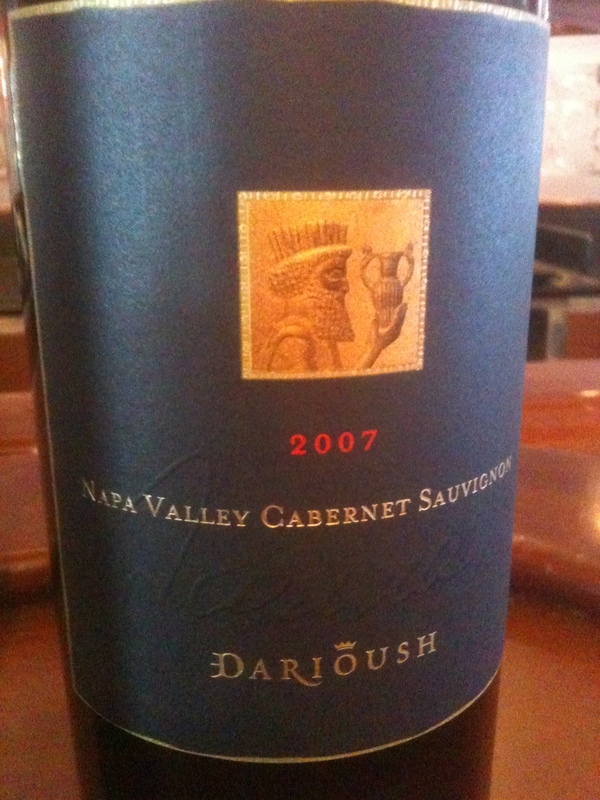 From the start, however, Darioush made it clear that the wines should be judged on their own because what is being produced in Napa is very different from what they are doing in Bordeaux. The glasses used for the tasting were very unusual. Mr. Dufour said that the glasses, made by the Reidel Glass Company of Austria, were made solely for tasting wine, not drinking it. The tulip shaped bowl rested on a hollow stem one inch wide and two inches high. The wine was poured into the stem and the bowl remained empty. In order to coat the sides, Mr. Dufour laid a glass on its side and the wine went to the edge and stopped. He then turned the glass until it was coated with wine. This works great but care must be taken not to pour a little too much wine into the stem or it could spill out. Darioush said that there were 60 different types of soil in the Napa Valley and that during the harvest the grapes can be picked at three different times. Russian River Chardonnay 2007 100% Chardonnay. The wine is barrel fermented and spends 11 months in 75% new French oak and 25 % in used barrels of Siruge, Damy and Francois Freres Burgundian barrels. 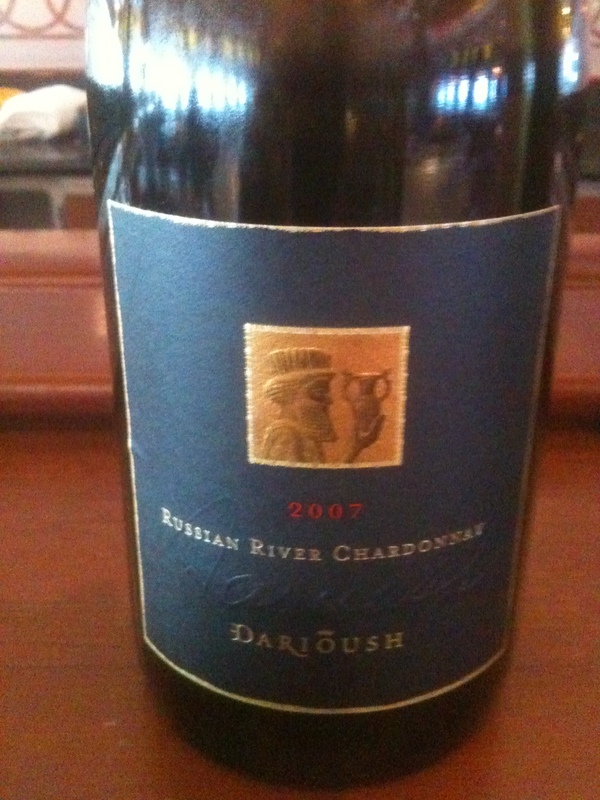 Darioush said that there was very little rainfall and that it was the lowest Chardonnay yield of the decade. Darioush does not own this property. This is a big Chardonnay but not over the top with citrus fruit and hints of white peaches and nice acidity. Chateau Brane-Cantenac 2004 Margaux 55% Cabernet Sauvignon,40% Merlot, 4.5% Cabernet Franc and 0.5% Carmenére. There are 6,666 to 8,000 plants per hectare. The wine is aged in barriques for 18 months of which 60% to 70% are new. Mr Dufour described this as classic Bordeaux and he was right. Napa Valley Shiraz2007 100% Shiraz. The wine spends 18 months in new French oak Siruge, Damy and Francois Freres Burgundian barrels. Darioush said that the length of time a wine spent in wood depended on the vintage. This was one of the biggest wines that I have ever tasted with a mixture of chocolate, spice, bold fruit and a hint of cinnamon. Darioush was born in the Shiraz region of Iran. He is very fond of his Shiraz wine and feels this is the correct name for the grape. He also said that he believed that Iran, and in particular the city of Shiraz, was where wine was first made. Napa Valley Cabernet Sauvignon 2007 85% Cabernet Sauvignon, 7% Merlot, 5% Cabernet Franc and 3% Malbec. The wine is aged for 22 months in new Taransaud Chateau traditional French oak barrels from Troncais. There was a mixture of mocha and bold fruit with under tones of expresso. 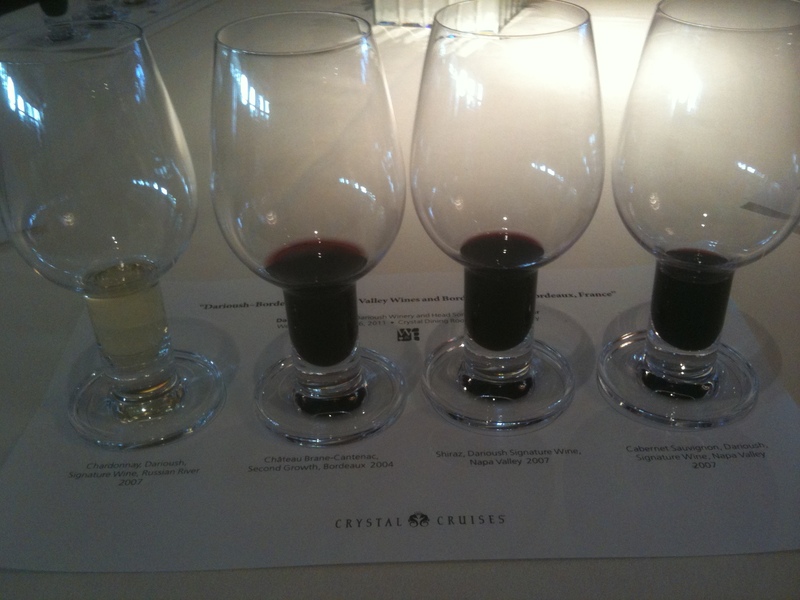 The Bordeaux in the tasting was placed before the Shiraz and Cabernet Sauvignon. This was correct because the Shiraz and Cabernet Sauvignon were very big alcoholic wines typical of California. Later in the cruise, I had the chance to taste the olive oil from Darioush. It was excelent. 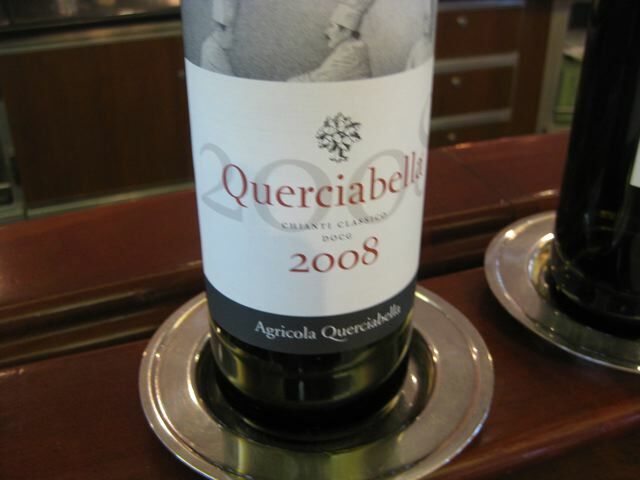 Sangiovese in Tuscany was the title of tasting that I did on the last day at sea, but more on that next time. Alfonso Cevola, a friend and wine writer from Texas, was in town recently and asked me to meet him for a pizza. It would be a reprise of a wonderful dinner we had enjoyed two years ago at Keste Pizza and Vino where we ate and talked while drinking Vallana Spanna from the 1950’s. While I looked forward to seeing him again, but there was a problem. That afternoon I was attending a Bordeaux tasting and lunch for the Wine Media Guild at Felidia Restaurant. There were 12 wines to taste followed by four to drink with lunch. Many of the Wine Media Guild members would bring older vintages and I knew it was going to be a great afternoon. But I looked forward to seeing Alfonso again so we made plans to meet for dinner and I hoped for the best. As it turned out at my table at lunch we had the 1982, 1986 and 1988 Chateau Mouton-Rothschild, 1993 Chateau Lafite Rothschild and the 1975 Chateau Grand Puy Lacoste among others as we shared wines with other tables. The wine which was at its peak was the 1975 Lacoste. It was surprising to me that the 1982 Mouton was still too young. But more on these wines in another article. I made plans with Alfonso to meet at La Pizza Fresca that night at 7:30 so I would have enough time to recover from lunch. I invited Nicole and Travis a young couple that always bring wines much older than they are. At the WMG I was sitting next to Ed McCarthy, co–author of the Wine for Dummies books with his wife, Mary Ewing Mulligan, MW. Ed said that Mary was away on a press trip so I invited him to join us for dinner. 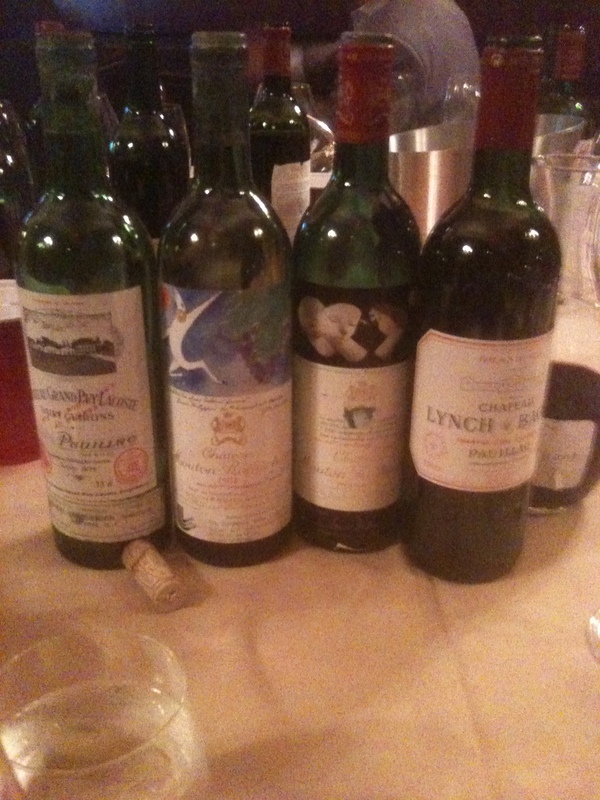 After the WMG lunch there were some open bottles with wine still in them at our table, among them Lafite 93, Lynch Bages 1996 and 2000 and two bottles of Clerc Milon 2004 and 2006 I took them along for the others to taste at dinner. Travis and Nicole arrived with a bottle of Champagne Grand Cru Godmé Pére et Fils Brut Millesime 2000 and the 1961 and 1964 Barolo from Fontanafredda. Ed brought a bottle of Champagne Benoit Lahaye Grand Cru Essentiel NV and I contributed the 1988 Grato Grati, a de-classified Chianti Rufina. I wanted Alfonso to taste the Grato Grati and really wanted to bring the ‘82 but somehow I picked up the 1988. It did not matter since the wine was drinking very well. Both the 1961 and 1964 were in very good condition. 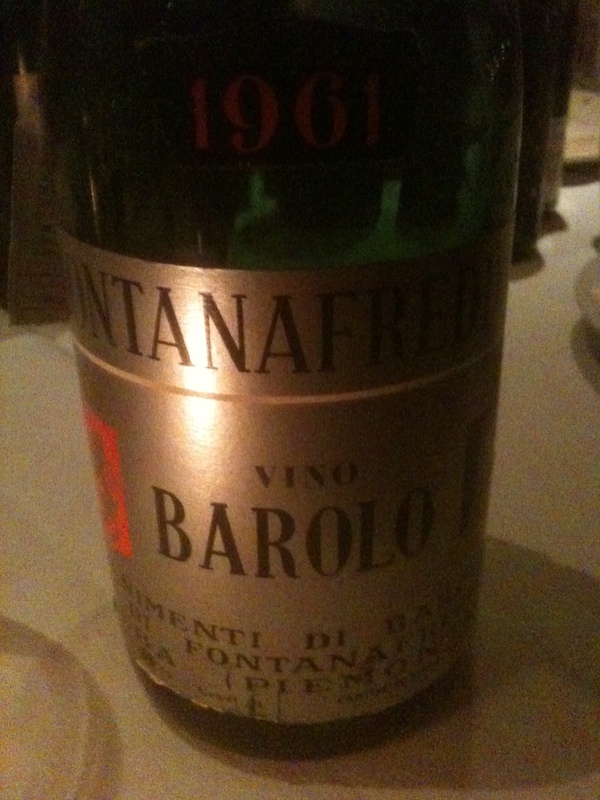 1964 was a great vintage in Barolo and it was in very good condition and might have a “few” years in front of it. 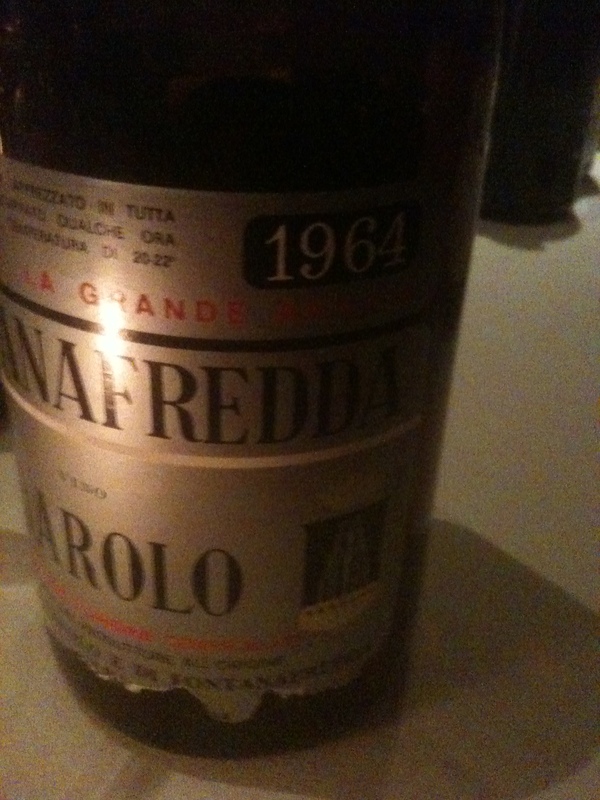 The 1961 was at its peak and I really enjoyed it with my pizza Margarita! I just returned from a Crystal cruise of the Greek Islands and Turkey with Michele. 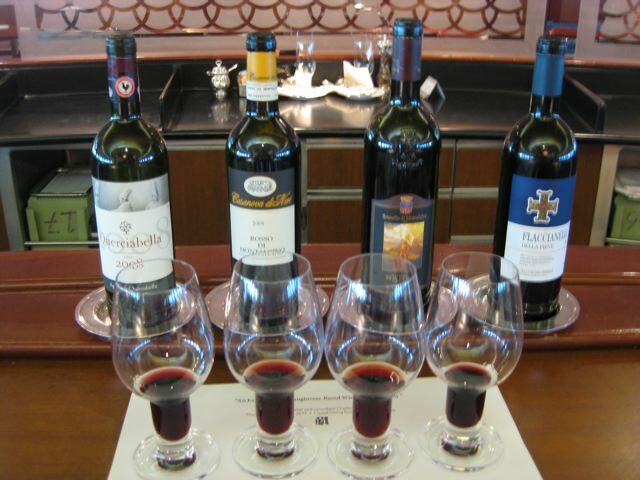 More on the trip, my on board wine tasting lecture, and how to make the perfect Martini in a future article!